Also Known As: "Sam", "Melchizedek", "Sum", "Ge'ez: ሴም"
Son of Noah . ; Nuh (Noah) and Naamah . Brother of Yafes (Japheth); Ham; Kenan; Ham . and Japheth . Arpachshad King of Arrapachtis . Genesis 9:18-29 respectfully covers his drunk father, Noah, with his brother Japheth. Genesis 10:21-31 lists his descendants, the Semitic races, named for him (Shem = Sem). Genesis 11:10-32 lists his lineage to Abraham (9 generations later). Please do NOT merge this profile with any profiles for Sceaf. The sources for the two are nothing alike. As such they can NOT even possibly be a match. Father of many nations, possibly Malchizedek. Descendants lived in Mesha to Mt. Sephar (in the east). Shem helped his father, Noah, build the ark. He and his family are referred to as the 'Semites'. Genesis 11:10 - 'This is the account of Shem. Two years after the flood, when Shem was 100 years old, he became the father of Arphaxad. Shem was the traditional ancestor of the Shemitic or semitic races - a group of kindred nations, which includes the Arabs, the Hebrews and Phoenicians, and Aramaeans or Syrians, the Babylonians and Assyrians. He was given Asia within the Euphrates to the Indian Ocean, by his father Noah. 22 The children of Shem: Elam, and Asshur, and Arphaxad and Lud and Aram. 23 And the children of Aram; Uz and Hul, and Gether and Mash. 24 And Arphaxad begat Salah and Salah begat Eber. 25 And unto Eber were born two sons: the name of one [was] Peleg; for in his days was the earth divided; and his brother's name [was] Joktan. 26 And Joktan begat Almodad, and Sheleph, and Hazarmaveth, and Jerah. 27 And Hadoram, and Uzal and Diklah, 28 And Obal, and Abimael and Sheba, 29 And Ophir, and Havilah, and Jobab: all these were the sons of Joktan. 30 And their dwelling was from Mesha, as thou goest unto Sephar a mount of the east 31 These [are] the sons of Shem, after their families, after their tongues, in their lands, after their nations. Lud "strife" (sons were Pethor and Bizayon) - (Ludim, Lubim, Ludians, Ludu, Lydians, and other related groups in Asia Minor—generally classified today as Indo-European). Aram "exalted" (sons were Uz, Chul, Gather and Mash) - (Aramaeans). According to Luke 3:36 Jesus is a descendant of Shem. Shem (/ʃɛm/; Hebrew: שֵׁם, Modern Shem, Tiberian Šēm; Greek: Σήμ Sēm; Ge'ez: ሴም, Sēm; "renown; prosperity; name"; Arabic: سام Sām) was one of the sons of Noah in the Hebrew Bible as well as in Islamic literature. Genesis 10:21 refers to relative ages of Shem and his brother Japheth, but with sufficient ambiguity to have yielded different English translations. The verse is translated in the KJV as "Unto Shem also, the father of all the children of Eber, the brother of Japheth the elder, even to him were children born.". However, the New American Standard Bible gives, "Also to Shem, the father of all the children of Eber, and the older brother of Japheth, children were born." Genesis 11:10 records that Shem was 100 years old at the birth of Arphaxad, two years after the flood; and that he lived for another 500 years after this, making his age at death 600 years. The children of Shem were Elam, Asshur, Arphaxad, Lud and Aram, in addition to daughters. 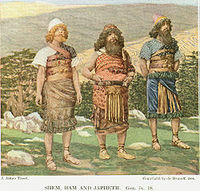 Abraham, the patriarch of the Hebrews and Arabs, was one of the descendants of Arphaxad. Islamic literature describes Shem as one of the believing sons of Noah. Some sources even identify Shem as a prophet in his own right and that he was the next prophet after his father. In one Muslim legend, Shem was one of the people that God made Jesus resurrect as a sign to the Children of Israel. The 1st-century historian Flavius Josephus, among many others, recounted the tradition that these five sons were the progenitors of the nations of Elam, Assyria, Chaldea, Lydia, and Levantine, respectively. The associated term Semitic is still a commonly used term for the Semitic languages, as a subset of the Afro-Asiatic languages, denoting the common linguistic heritage of Arabic, Aramaic, Akkadian, Ethiopic, Hebrew and Canaanite-Phoenician languages. According to some Jewish traditions (e.g., B. Talmud Nedarim 32b; Genesis Rabbah 46:7; Genesis Rabbah 56:10; Leviticus Rabbah 25:6; Numbers Rabbah 4:8. ), Shem is believed to have been Melchizedek, King of Salem whom Abraham is recorded to have met after the battle of the four kings. Shem is mentioned in Genesis 5:32, 6:10; 7:13; 9:18,23,26-27; 10; 11:10; also in 1 Chronicles 1:4. Dos años después del diluvio, cuando Sem tenía cien años, nació su hijo Arfaxad. Después de esto, Sem vivió quinientos años más, y tuvo otros hijos e hijas. (Gén. 11:10-11). Sem mismo pudo haber escrito esta genealogía puesto que su vida, superó los 427 años desde el diluvio hasta Abraham. Sem pudo haber nacido alrededor del año 2448 a. de J.C., su vida se extendió por seiscientos años, a lo largo de ocho generaciones de setenta años cada una! Lo que indicaría que Sem murió en el año 1848 aproximadamente. (21) También le nacieron hijos a Sem, padre de todos los Bene-Heber y hermano mayor de Jafet. (22) Son hijos de Sem: Elam, Asur, Arfaxad, Lud, Aram y Cainán. 32 Y siendo Noé de quinientos años, engendró a Sem, a Cam y a Jafet. Birth of Arpachshad King of Arrapachtis . 10 Estas son las generaciones de Sem: Sem, de edad de cien años, engendró a Arfaxad, dos años después del diluvio. 11 Y vivió Sem, después que engendró a Arfaxad, quinientos años, y engendró hijos e hijas.